Dreugh Shell Armor is a rare Neutral item card. It is part of the Core Set. This card was previously part of the training mechanic where it could be upgraded from Snapping Dreugh at level 5. 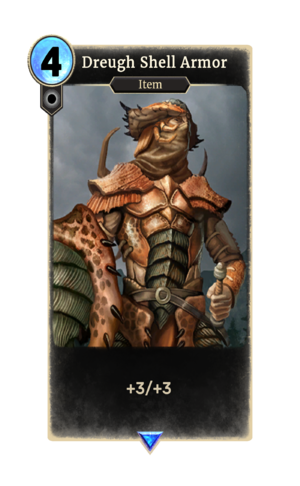 Dreugh are a race of crab-people who have appeared in Daggerfall, Morrowind, Oblivion, and ESO, though Dreugh Armor only appeared in Morrowind. This page was last modified on 3 February 2019, at 19:24.